Kristin and I got married in Oslo 10 years ago. Since a decade doesn’t come around too often, we splurged and stayed at the same hotel we stayed at 10 years ago, Grand Hotel. Grand is very old, best known as the venue for the Nobel Peace Prize. Yes, Obama stayed there as with other winners, and our room was a couple of doors down from the Nobel Suite. The rooms are classy with high ceilings but fall short of being ostentatious. The location is great: it’s on the main shopping and parade drag in Oslo, Carl Johan Gate, across the street from Stortinget (the house of parliament) and the national theatre. The royal palace is just a couple of blocks down the road. The Grand Cafe on the first floor of the hotel is a wonderfully relaxing place with big leather seats. It used to be the hangout for intellectuals and Bohemians: Ibsen drank and ate there everyday. Sitting in the cafe sipping a glass of Chablis, I thought about all the contrast of these last months. Just absurd. A week before I was kneeling in the middle of our living room in Rødøy filleting three gargantuan pollock. I go back and forth between feeling like a hill-billy in a big city, or an urbanite returning from a countryside vacation. I had not left rødøy’s few square miles in two months before this trip out. And before Rødøy, I rarely stayed in the same country for 2 months straight. Not until I pulled these stats together did I realized how the last 10 years have been a lost decade for America. Two wars and other very unwise policies left America stagnant economically, diminished politically, and polarized socially. 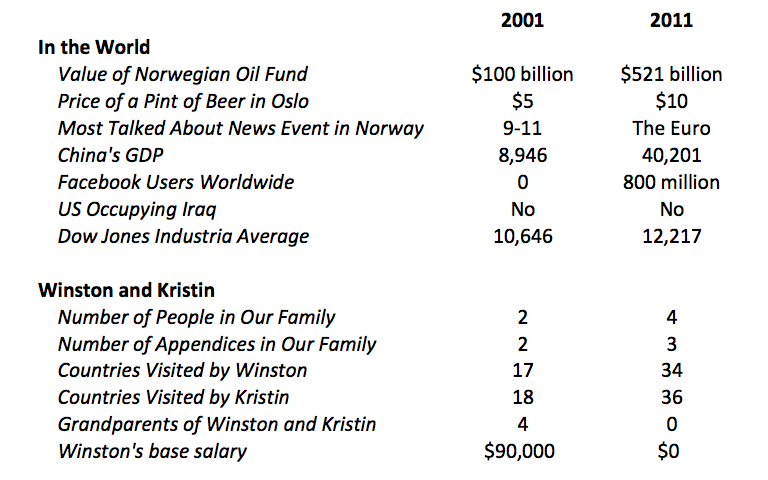 Norway has been a beneficiary of America’s actions, enjoying 10 years of elevated crude oil prices, building up the world’s largest sovereign wealth fund that owns more than 1% of all the world’s publicly traded stocks. Unlike America, for Kristin and I the decade has been quite alright. I compiled a set of photos from our 10 years of marriage. 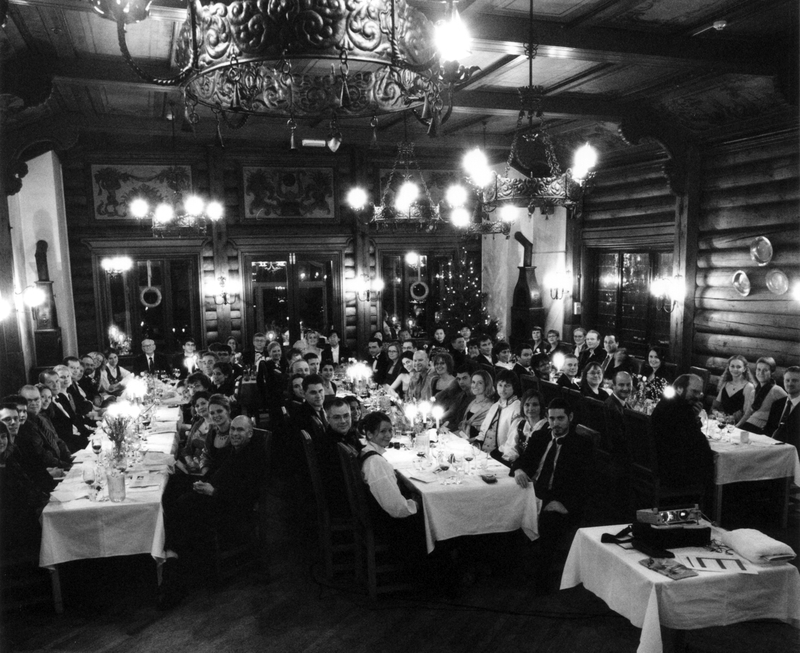 We looked through them later in the evening, and decided to do it for another 10… In 2021, we’ll come back to Oslo, the Grand Hotel and Frognerseteren. Who knows? Maybe we’ll decide to do another 10 years. But what will the world look like then? It’s anybody’s guess. Happy Anniversary, Winston and Kristin! The site of your wedding (and anniversary celebration) is lovely – how wonderful that you were able to revisit it. (btw…What does “number of appendices in our family” mean?). Nappy New Year and the next ten so as the next one hundred! Happy anniversary and happy new year to you 4!